I'm excited to announce that "WikiTree X" is now open for beta testing. This is a Google Chrome extension/plugin created by Justin York. It helps you create and edit WikiTree profiles using data on external websites. On Lorman-6 I clicked "Research" in the pull-down menu to access the RootsSearch tool, then clicked the FamilySearch button. This led me directly to a number of sources, starting with a birth record. I clicked the details page for her birth record. The WikiTree profile was missing her birth location, so I clicked the icon in my Chrome browser to open WikiTree X. I entered Lorman-6 in the "Update an Existing WikiTree Profile" section. This let me add the birth location and the birth record as the source, without me needing to type or copy-and-paste anything. I then saw that FamilySearch had a death record for her son, who wasn't on WikiTree yet. I went to the details page for the death record and clicked the WikiTree X icon. I entered Lorman-6 in "Create Related WikiTree Profile" and selected "Child". This automatically filled in all the information in the WikiTree form for creating a new person. All I had to do was review possible matches before proceeding to create Hansen-7061. This could be very handy if a census record or an external tree has a lot of family members that are missing from WikiTree. WikiTree X is not for everyone, especially right now. I think it should only be used by experienced WikiTreers, and those who have the patience to use something new and a bit rough. Personally, I think it's already really useful. I'm using it to add family members for an autosomal DNA match of mine after he shared his Ancestry tree with me. But it may not be useful for you in its current form. See https://www.wikitree.com/wiki/WikiTree_X for more info. To get the extension, click here. If you spend some time with it, please post here. How well did it work for you? Did you figure out any tricks for getting it to work? Any suggestions or questions? I do not get a blank page when I click on that link. @Jillaine Smith, the issue is once that page is up, using the tool to create a new Wikitree profile, it does not fill in the profile info, it is all blank entries. Sometimes I get a blank entry page using Find A Grave. @William thanks for reporting that. We'll try to get it fixed. Middle name on females is actually surname and surname is actually married last name. [http://www.findagrave.com/cgi-bin/fg.cgi?page=gr&GRid=100051054 Find A Grave, database and images] (accessed 24 December 2016), memorial page for Stella Salyer Allen (1893 - 1978) - Find A Grave Memorial. Try to process the link to turn it into standardized GRid record locator for the URL. This sounds pretty exciting, I spend a lot of time going back and forth between FamilySearch and Wikitree to put sources on my profile. Will try this out soon. I found it wonderful for several hours, and then it stopped working completely. I used it successfully on Find-A-Grave, FamilySearch, and Ancestry, but now I can't get it to work on any of the above - it simply says that there is no data on the page. I restarted everything, reinstalled the extension, etc., but no joy. **Edit. And today it is working fine again. Not sure what happened, but when it works it is awesome - way to cure my carpal tunnel! I appreciate the ongoing efforts to improve WikiTree. Thanks to all who work toward that end. I just tried this extension, and am very excited to be able to get info from my Ancestry tree without typing every detail! Yay! This, even though on my machine Chrome and Ancestry don't play well together, and I had to open my Edge browser to get some of the details. But I like copy/paste, so I am satisfied that it will help me a lot! Thank you, thank you, thank you! Sounds like something to do this weekend after I finish my 1000 contributions for this month. My only possible hold-up is that I have an older operating system and so I don't know if the app will work until I try it. Now that I've used it for a few hours, I consider this an *indispensable* tool. I'm used to the quirks of using it now, and I love, love, love it. So my recommendation is to try it as soon as possible. I have enjoyed this new tool very much. It works great for me. Find A Grave, database and images (http://findagrave.com : accessed 22 November 2016), memorial page for Rev Samuel Russell (1693 - 1746) - Find A Grave Memorial. Either of those two links would be faster and more useful. Other than that, it is a very handy tool. Thank you! Find A Grave, database and images (http://www.findagrave.com/cgi-bin/fg.cgi?page=gr&GRid=32305279 : accessed 22 November 2016), memorial page for Rev Samuel Russell (1693 - 1746) - Find A Grave Memorial. Does this occur with Find A Grave records listed on FamilySearch or Ancestry? The FindAGrave source from FamilySearch.org does not include the FindAGrave link directly to the FindAGrave memorial. I do not know about Ancestry. I do not have access. Fact: Burial Ancient Cemetery, New London, New London County, Connecticut, USA. Yes this template is great. I have been changing all hard links to Find A Grave I come across to this template. Oh, that's going to come in really handy. I just added the first of what will probably be many profiles. I didn't care for the notes that were going to be placed in the biography, so deleted them before saving. Is there an operational reason I should leave the "Facts" portion in there? I added a comment to the source, surrounded by one set of square brackets (). Upon review of the new profile, that comment was surrounded by a double set of square brackets ([]), causing it to show up as a link. While I like the thought of the comment being in a different color, I'm not sure the result is what you were trying to achieve. I modified it to have the formatting template for blue but you should be able to see the original in the change log of Mollie Fore. Never mind, probably a PICNIC ("Problem In Chair Not In Computer") error. To add to that, I next did an update, this time on Isabella Fore. I added the 1900 Census source, choosing not to update any of the vital fields. Instead, I added a data extract to the source. Rather than just surrounding it in square brackets, I used the format template for blue. That worked perfectly. I'm not excited about the description of changes that is automagically added. The description means absolutely nothing to the casual observer (i.e., someone who is not using the Chrome X extension). Is there any chance of revision on that? On FamilySearch, the source that's being pasted in has the html code for italics (i.e. <i></i>) rather than the Wikicode of two single quotes at the beginning and end. Is that something that can be adjusted on the back end or do we need to remember to change it each time? I thought the preferred method for the Sources section was that the <references /> tag should always come just after the Sources heading, then to be followed by See Also: and any other sources. Just a note: I'm channeling a former life in which I functioned as a programmer, quality control tester, user interface tester, and user liaison for software projects. I worked under the theory that we couldn't make it better if no one asked the questions. If I'm getting on your nerves, tell me to stop. Hi Debi. Don't stop! This can be very helpful. If you're up for it, I might ask you to help organize and sort the feedback a little down the road. Happy Thanksgiving! Debi, the HTML code for italics is being added by the app, that is the only change being made to the citation that appears under the Cite this Source section on the record page so I have to wonder if that is just the programmers preference on the display. @Chris, let me know how I can help. @Dale, I just tested the square bracket thing again and didn't get the same results. I've got a feeling that one is a PICNIC error ("Problem In Chair Not In Computer"). I'll strike it from my note above. Debi, I was commenting about the <i> </i> HTML coding not the bracket thing. I only tried a couple of profiles, I am going to be busy for the next several days and have very little time to try and figure this out right now. Ahh sorry, Dale, I thought it was a two part answer. Go enjoy the holiday and good luck with your move. Putting FamilySearch in italics is the "EvidenceExplained" method. Many of the FamilySearch citations already have it italicized but some of the older ones still do not. My preference would be that the WikiCode for italics be placed around FamilySearch on all sources, even if it don't exist on the original citation at FamilySearch.org. Others may disagree. I also agree w/ Kitty up there that a link to the actual memorial for the Find-a-Grave profiles would be completely awesome. Find A Grave, database and images (http://findagrave.com : accessed 22 November 2016), memorial page for Lucile "Minnie" Taylor Wells (1872 - 1955) - Find A Grave Memorial. I don't know if Justin can parse the memorial number to add to the template or not but that's what I would like to see. Ancestry sources are VERY generic, just the database name, the publisher's info, and the originator of the database. I'd like to see at least the name of the person in the record and a link to the database be included. Both of those pieces of information can be found at the top of the screen where it says "John Doe in the U.S., Find A Grave Index, 1600s-Current"
"No data found. 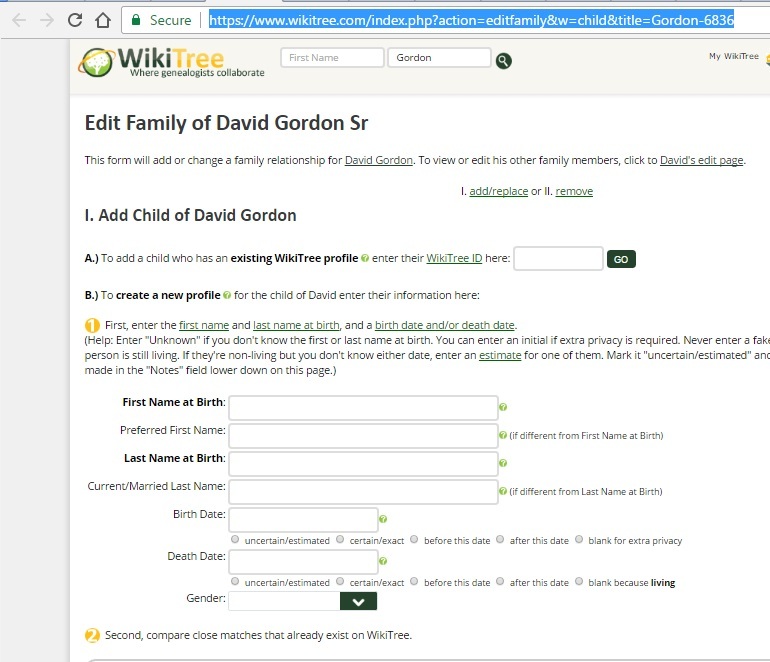 To use WikiTree X, start on an external web page that has person data, such as a FamilySearch Tree profile. I get the same for a couple of different records, census and death, for a couple of different persons/profiles. Vic, I get that error message on FamilySearch if I forget to open the details page and try to use the extension from the search results page. Could that be what's happening? Probably no explanation needed, but just in case, open the details page by clicking the sheet of paper icon on the far right side of the search result. To follow up on that, I just got the error on Ancestry in the following manner. I was looking at one record and had used the extension to add it. In the list of records on the right side, the guy's WWII Draft registration was an option so I clicked that. I viewed the image to confirm it was my guy, closed the image, clicked the extension icon, and put in the profile number. The update screen appeared with the error message. I went back to the record, clicked the link for the person (the only link there in this case) in the household members names section. That changed the display to what appeared to be exactly the same record. This time when I clicked the extension icon no error occurred. I just ran across an instance on FamilySearch's SSDI database having the first day of the death month as the event date. I had already found the death record so had a good death date but it was a reminder that the SSDI date and place should not be used as the date and place of death. The event date and place in the SSDI usually represents the date the last check was issued and the location to which it was sent. Just did a quick test this morning and it seems to work fine for me. I will not have much time to work with it until sometime next week and hope to test it out better then. After trying a few more profiles with this I decided that this app is not a good fit with my process. For that reason I will not be using it. Once you get the hang of it, this definitely makes it much easier to add new people. It would be cool if you could add all children at once from a census record, but hey, this is still a great tool. One problem I ran into, though, was that it took the information from the "last place of residence" from the social security death index and added it automatically into the place of death field. Sometimes it happens to be the place they died, but frequently it isn't. Thus, it is a *really* bad idea to automatically use that information as the place of death. So far as I know, the social security death index does not give a place of death. Does that occur with the SDDI on FamilySearch or Ancestry? FamilySearch. I don't have an Ancestry subscription at the moment, so I didn't/can't try it there. Thank you Justin. Very cool new feature. Will help with productivity. I used it for one Ancestry record and liked the concept. Like you mentioned there are still some issues. Here are my suggestions. Do want them submitted here or do we raised new questions? See profile https://www.wikitree.com/wiki/Hunter-4731.I will leave profile as is for a few days.Some have been reported, but this what I noticed. 1. Moving the reference tag to the end makes most of the profiles I work on worse. In this profile the == Sources === were followed by <references/> then a See also: section. It flipped the order. I suggest if Reference markup is there its should not be moved. 2. Source text of "(Imported data from external site 1) should indicate what site 1 is. 3. 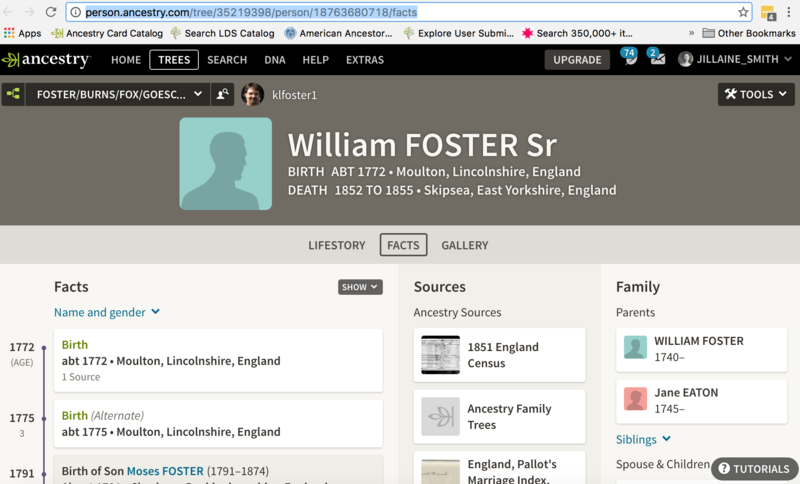 Include the URL for Ancestry records links even though they are not in the generated linked like they are for Familysearch. Big deal as this is key to PIP efforts and ability to collaborate on facts. without doing more search to find the record. 4. Drop the white space in the source (need to look at profile in edit mode). There is white space before and after "Original data". This is only a wiki source issue as the section looks find when just displaying the profile. 5. I think it added an extra line before the == Source ==. Kind of a pet peeve how much white space profile have here. As the world moves to smaller devices, these blank lines are even a larger barrier to viewing profiles. Let's see if I can out test Debi Hoag ;-). We have similar career arcs. Also, I agree with comments about not picking up User Trees in Ancestry.com, Geni content, the equivalent in FamilySearch, and other non-sourced trees. I tried it for FamilySearch, Here are my suggestions. See profile https://www.wikitree.com/wiki/Porterfield-1157. I will leave profile as is for a few days.Some have been reported, but this what I noticed. 1. So if we are going to add "Facts:" line can we make these in-line links <ref></ref>. In one way this behave worse thing Gedcom import in that sense. Pretty please on this one. 3. Change log text of "Imported data from external site 1" and imported form long meaningless number could be mor descriptive. 5. er "Original data". This is only a wiki source issue as the section looks find when just displaying the profile. I want to extra-agree with the in-line references for "Facts" lines entered into the biography. Not only is it best practice on its own, but makes it much easier to cut and paste the ref text along with the fact when manually integrating it into the main biography text. So, I did a little bit of a demo video of Wikitree X this morning. If you're transferring info from FamilySearch, make sure that the info there is accurate and complete before you start -- there are often entries on the FS profiles that were created by an automated procedure and are not always correct. Check the sources that are attached to the FS profile. Again, sometimes they're not accurate. In the video, I didn't transfer over all of the sources for the particular profile that I chose because I didn't want to make the video any longer. Normally, I would make sure that I captured all of the relevant citations for the profile I'm working on. Very nice! Thanks, Julie. I love seeing these screen-capture videos, like Magnus does. Thanks! Tested it out with Find A Grave, and it worked nicely. This could really improve my productivity. The only thing was that it put the maiden name as the middle name, since on Find A Grave, the maiden name is usually written before the married surname. This is not really a problem as long as you are careful to enter the correct LNAB. Also wondering, are you planning on adding support for Geni.com? I added a lot of profiles on there at one point, and this would make it easier to transfer them over. Just found this and it makes life so much easier. I have been working on adding the descendants of Robert A Samples and this will help so much. In my naivety I did not realize how many people that would be. Would love to see this work from RootsWeb's WorldConnect databases where I regularly refresh data from my genie program. Using this successfully in different contexts, wonderful addition. With one exception . . .
DNA Connections are not being added to appropriate new profiles that I create. No difference in how I begin them--Create Related or Create Unrelated. All about the extension proceeds well, accurately, but at finish, there is only a DNA note. Am I overlooking something about this? Jo, It can take up to 24 hours before any DNA connections appear on a profile, because they're only updated once a day. I haven't used WikiTree X, but I wouldn't be surprised on a new profile that I don't see the expected DNA test information. I tried the WikitreeX this morning and wow!! Wonderful. I added seven children to a profile (from ancestry tree) in a matter of minutes rather than hours. Yes, some clean-up was required as I entered and additional clean-up is needed to make the profiles look "prettier"; however, entering the basic data was fast and easy. One female auto-populated with married name as her maiden name, but I caught before I clicked "save". Thanks for a wonderful tool. I will use this often!!! Uh oh. Making it even easier to copy questionable family trees from ancestry.com? How is this a good thing? I was successfully using WikiTree X for a while when it initially came out. This last week, though, it is not working correctly. The WikiTree page is opened, but none of the fields are filled in. I expected to see Name, Dates of birth and death, place of birth and death, as well as a list of sources references. 2. Update information in Ancestry, including accepting appropriate hints. 3. Select WikiTree X icon next to the URL Address bar and select "Create Related WikiTree Profile. 5. Enter Gordon-6836 in edit field. 2. None of the fields are populated with values. Peggy, Ancestry changed their URLs recently. We discovered the issue yesterday and released an update version 1.2.1. Does it work for you now? Yes. Thank you. It is working as expected again. I appreciate the speedy fix. BTW, I am a professional software tester (retired). Is this the appropriate forum for reporting issues with WikiTree X? Would you like me to examine specific issues? Also, are you interested in requests for enhancements? Yes, G2G is a good place to report issues and request enhancements. It allows other community members to see and perhaps join the conversation (which is especially good for enhancement requests). I was using this app everyday and it is very frustrating to have it not working. I did uninstall and reinstall 3 times and that did not help me. Kari I don't know what problem you were having but we did just release a fix for Ancestry profiles in v1.4.6 of WikiTree X.
I am finding this helpful in some respects; it's not any quicker for some things though, than using root search - which is to say, not as quick as Ancestry is for building trees, which would be a good benchmark to shoot for. When adding relatives from census, it doesn't automatically fill in the birth date. It would be great it if were "smart" enough to enter the actual bio event, e.g "Residence" or "Birth" rather than "Fact - (1905) Brooklyn"
In another instance, an abstract of Military Service for WWI merely added the source citation but no supporting fact in the bio. It sounds great! Is there going to be a version for Firefox as well? Linking Family Search profile to Wiki Profile?